This weekend I had the pleasure of attending Childsplay’s ensemble performance of Junie B. Jones is Not a Crook. I was hoping to take my 5-year-old to the show but since she has a busier social calendar than most celebrities, she was unable to attend with me. Luckily my 13-year-old daughter (who happens to remember reading all of the Junie B. books), along with a friend of hers and my wonderful 11-year-old niece, were my dates for the afternoon. I was a little nervous that the show wouldn’t be as enjoyable for the older children, but the production knocked it out of the park and provided comedy and subject matter great for all ages. First of all, if you haven’t been to the Tempe Center for the Arts, you must go check it out. It is spectacular. Inside and out this facility is gorgeous and it really made all of us feel like this was a very special occasion. The show itself, the first of Childsplay’s 40th Anniversary season, is actually a cleverly woven combination of two books, Junie B. Jones is Not a Crook and Junie B. Jones Loves Handsome Warren. Right from the get go when introduced to Junie B. and her colorful friends you realize that she is different and in a really good way. She is fun, quirky, outspoken and animated in a way that makes you immediately like her no matter what she is up to. The show revolves around two main storylines: Junie B.’s exhaustive search for her “stolen” super soft furry black mittens and how everyone at school is reacting to the arrival of a handsome new boy at school. Kate Haas added such brilliant comedic timing to her performance as Junie B. that she was getting laughs from toddlers and adults alike. The rest of the cast was also wonderful with all of them playing dual roles to perfection. I was pleased at the valuable lessons that came from these storylines about choosing to do the right thing and how to treat others. At the end of the show my older girls were discussing how they had just befriended a new girl at school. It made me so happy that they were taking away from this performance how truly important it is to welcome new people into their lives. From a technical standpoint, the set was bright and fun and transitioned wonderfully from scene to scene. We really liked how innovative the props were, especially the magic pen and how Junie B. was able to create her incredible pictures. (You’ll have to check this out for yourself!). The show ran slightly over an hour and the music, sound and terrific dialogue really kept it moving along and kept the audience engaged the entire time. You should definitely take your family to see this show. Childsplay recommends this production for children 5+ and I think that is spot on. But don’t hesitate to bring your older children as well. At the end of the performance the cast even answers questions from the audience allowing the children to find out more about how they transition into their different costumes, how they became actors, and what the motivation was for their characters. It as really a wonderful experience for all. And I must add that my favorite line of the entire show was…“It’s ok to be a nutball!” It is indeed. 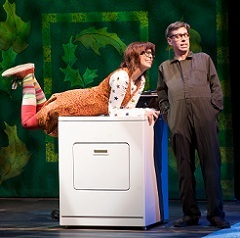 Anyone familiar with the Barbara Park “Junie B. Jones” series of children’s books will understand why anyone with young children should not miss the opportunity to attend a performance of “Junie B. Jones is Not a Crook”; presented by the Childsplay Theatre and performed at the Tempe Center for the Arts. Before I get into my review of “Junie B. Jones is Not a Crook” I would like to take a moment to acknowledge those who bring the magic of the stage alive and all the hard work that begins well before the actors ever take the stage. When I was chosen to be one of the family bloggers for the Childsplay Theatre, I was afforded the opportunity to take my family on a private behind the scene tour of the Childsplay Theatre workshop. We were able to see the costume, prop and set design process, from 2D full color renderings to the finished props, costumes and sets. We met Jim Luther the Prop Master and a 10 year veteran of the Childsplay Theatre and got a firsthand look at how he uses his experience and talent to create innovative ways to bring seemingly everyday items that would not easily be seen on stage to a scale that helps the story and becomes an integral tool for the actors on stage. A special note of praise should be given to all the set designers who brought the kindergarten school yard of Junie B. Jones to the stage. The set designs worked on every level, quickly morphing from school yard to school room or Principals office even Junie’s bedroom. Kudos to all the people behind the scenes, far too many to mention by name, who use their extensive creative talent to bring all the scenes to life and give the actors such a rich tapestry to work with. Now on to the review, playwright Allison Gregory worked directly with author Barbara Park, prior to her passing, to develop the on stage adaptation of “Junie B. Jones”. “Junie B. Jones is Not a Crook” is adapted from the Barbara Park books “Junie B. Jones Loves Handsome Warren” and “Junie B. Jones is Not a Crook”. Allison Gregory has succeeded in bringing the vivacious life of kindergartner Junie B. Jones from the author’s page to the theatrical stage. The cast of actors who bring all the Junie B. Jones characters to life on stage do a fantastic job of opening up the mind of a kindergartner. Not just any kindergartner but Junie B. Jones, a confident, out spoken, imaginative and somewhat crazy kindergartner with a very unique sense of fashion. Kate Haas the actor who plays Junie B. Jones as well as Jamie Sandomire, Racquel McKenzie, Debra Stevens, Tommy Strawser, Vinny Chavez and Rudy Ramirez who play all of Junie’s schoolmates, teachers and mother all do a fantastic job of delivering the audience into the frenetic kindergarten world of Junie B. Jones. I especially liked how the positive message to kids was maintained and the moral of both original books were preserved in this theatrical adaptation. In addition to seeing their beloved Junie B. Jones brought to life on stage, I know my kids really enjoyed meeting and speaking with the actors after the performance. They enjoyed the performance so much they could not wait to share their experience with their school friends and teachers on Monday morning. The run time of the play is 70 minutes with no intermission, which I found to be perfect for our children ages 7 and 8. In all we had a wonderful family time at the theatre and encourage anyone with young children or grandchildren not to miss this wonderfully funny theatrical production. Take this opportunity to instill in your kids a lifelong love and appreciation for the theatrical arts, they will thank you for it. Hi! This is our Family Review Team, live at the Tempe Center for the Arts, reviewing Junie B. Jones is Not a Crook performed by Childsplay Theatre. We can tell you already, this is one play your family won’t want to miss! You can get a sneak peek of our live video review right here! This world premiere by Allison Gregory is a delightful children’s play from the well-known Barbara Park book series. Two of her books entitled Junie B. Jones is Not a Crook and Junie B. Jones Loves Handsome Warren are fused together for a winning combination that will have your family both joyfully satisfied and yet yearning for more! 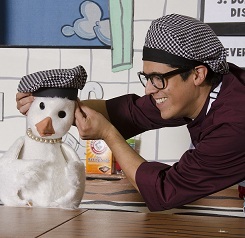 What does your family need to know about this Junie B. Jones Childsplay Theatre production? The first item is location, location, location!! The Tempe Center for the Arts was extremely accommodating to families with children. There is a scenic outdoor lounge with water views that is excellent for allowing kids to stretch their legs before the show. Don’t forget to grab your child booster seat on the way in! Here is our 3 year Junior Reviewer enjoying her complimentary booster seat. Once inside the well maintained theater, be prepared to watch a spark illuminate in your child’s eyes, as imagination comes to life through performance arts. 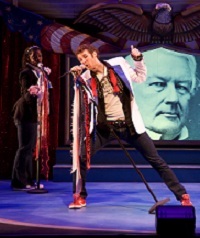 The 40th Anniversary Season of Childsplay Theatre productions will not disappoint you. Reflective of the Junie B. Jones books, Childsplay choreographed a beautiful dance between combustible energy and innocent sensitivity as they dared to bring the audience into a realm adults rarely go – the child’s imagination! I took my three children to this play fully aware they would most likely love it, yet I had no idea the impact it would make on me. It reminded me, as a parent, that children are experiencing enormous waves of unbridled emotion throughout the course of one day. They are learning how to process feelings, self-reflection, empathy, acceptance, self-worth, and how to navigate the bridges of friendship. This play gave me new eyes to see past my children’s often twirling and uncertain emotions, and inspired me to jump with both feet, into the heart of the imagination. Junie B. Jones leads the way, and I am so glad I allowed Childsplay to invite me in. Do you want to join us? If so, check out www.childsplayaz.org for ticket information. We will see you at the show! Joy Brownlee RN. BSN. MED. publishes family friendly reviews on culture, family, and food at http://www.ibelieveinjoy.com and is featured in “Snacking with Joy!” at www.sandiegofamily.com.